Minna’s VEGETARIAN CHILI (no beans) is almost like Minna’s popular Vegetarian Chili with Beans, but no beans. Otherwise, it is loaded with the same fresh vegetables and zesty flavor. This chili is great as a stand-a-lone meal. Serve it in a bowl to warm the bones on a cold Winter night or mix it with a spinach and iceberg salad on a hot summer day. 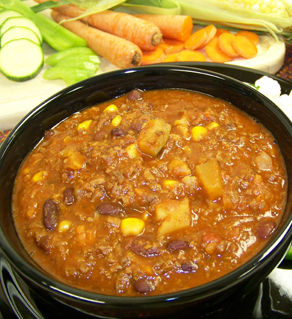 Either way, it offers delicious flavor, quality, and versatility; just like the Captain’s line of other chili favorites.